And guess what? It won’t turn brown! 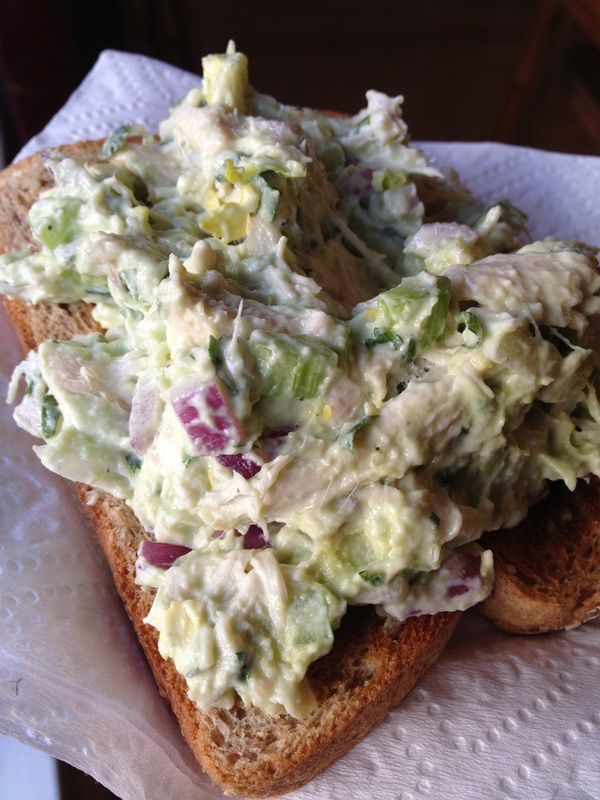 I made this recipe because I absolutely love chicken salad. It’s just not the most healthy thing in the world. I decided to make a recipe with healthy fats, but still leaving a creamy, yummy texture. The avocado chicken salad was born. This salad has all the fixings of guacamole in it, and it’ll keep for days without turning brown like traditional guacamole. Why? I’m not sure. But I like it. My guinea pig at home said this is his favorite thing I’ve ever made. I think that means this is a must-try! Serve it up by itself or on a piece of whole grain toast or crackers. Combine all ingredients in a mixing bowl except for the lime juice and avocado. Cut the avocado in half, take out the pit, and scoop out the meat of it with a spoon. Place on top of your other ingredients. Pour lime juice directly on top of avocado. Mash it up and mix into the salad. Season with salt and pepper to taste.